The U.N. General Assembly overwhelmingly approved the first treaty on the global arms trade. The new treaty reportedly seeks to regulate the $70 billion business in conventional arms and keep weapons out of the hands of rebels and human rights abusers. The official U.N. tally showed 154 votes in favour, three against 23 abstentions. The treaty will be open for signature on June 3 and will enter into force 90 days after the 50th signatory ratifies it. Reports say its takes two to three years for a treaty to come into force. 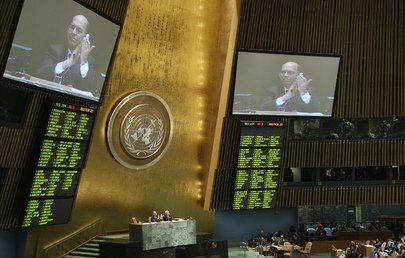 A view of the voting panels as the United Nations General Assembly votes to approve a global arms trade treaty. The treaty, which regulates the international trade in conventional arms, received 154 votes in favour. Three Member States Democratic People’s Republic of Korea (DPRK), Iran and Syria – voted against the decision, while 23 countries abstained. In his remarks at the historic outcome of the Arms Trade Treaty Conference, US Secretary of State John Kerry says the United States is pleased that the United Nations General Assembly has approved a strong, effective and implementable Arms Trade Treaty that can strengthen global security while protecting the sovereign right of states to conduct legitimate arms trade. He says the Treaty adopted today will establish a common international standard for the national regulation of the international trade in conventional arms and require all states to develop and implement the kind of systems that the United States already has in place. Secretary Kerry adds the treaty will help reduce the risk that international transfers of conventional arms will be used to carry out the world’s worst crimes, including terrorism, genocide, crimes against humanity, and war crimes. At the same time, Secretary Kerry points out the treaty preserves the principle that the international conventional arms trade is, and will continue to be, a legitimate commercial activity that allows nations to acquire the arms they need for their own security. According to Secretary Keyy, by its own terms, this treaty applies only to international trade, and reaffirms the sovereign right of any State to regulate arms within its territory. He says as the United States has required from the outset of these negotiations, nothing in this treaty could ever infringe on the rights of American citizens under its domestic law or the Constitution, including the Second Amendment. With the final round of negotiations from March 18 to 28 to reach consensus on an Arms Trade Treaty, the United States of America has voiced conditional US support for the UN arms trade treaty. 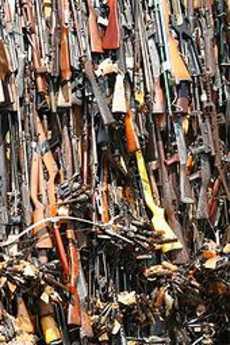 A tower of confiscated smuggled weapons about to be set ablaze in Nairobi, Kenya. US Secretary of State John Kerry said the US could only be party to an Arms Trade Treaty that addresses international transfers of conventional arms solely and does not impose any new requirements on the U.S. domestic trade in firearms or on U.S. exporters. The United States is the world’s No. 1 arms manufacturer. However, Secretary Kerry highlighted that US would not accept any treaty that imposed new limits on US citizens’ right to bear arms. Secretary Kerry says the United States looks forward to working with its international partners at UN conference to reach consensus on an Arms Trade Treaty that advances global security and respects national sovereignty and the legitimate arms trade. The US supported and actively participated in negotiations on an Arms Trade Treaty held at the United Nations in July 2012. The negotiations made considerable progress, but ended before a treaty could be concluded. The UN Conference on the Arms Trade Treaty (ATT) started on 18 March in New York which brings Member States together to continue negotiations on what is seen as the most important initiative ever regarding conventional arms regulation within the UN. According to the UN, at the end of 2010, an estimated 27.5 million people were internally displaced as a result of conflict, while millions more sought refuge abroad. The world body reports that the armed violence that drove people from their homes was fuelled by the widespread availability and misuse of weapons. Previously, four weeks of negotiations ended in July 2012 without agreement. Iran, Syria and North Korea have blocked the adoption UN’s Arms Trade Treaty, a proposal to regulate the global weapons trade. Reports say the three countries rejected the UN’s Arms Trade Treaty, saying that the document was flawed and the proposal failed to prevent a surge of weapons sales to rebel groups. Iran, North Korea and Syria are all currently under some form of UN arms sanctions. Media reports say the UN arms trade treaty supposedly would regulate the multibillion-dollar international arms trade which required agreement by all 193 U.N. member states.